The China Girl 66cc/69cc 2 cycle engine has basically 5 engine geometrics and could be broken into separate classes ie: PK80 – GT5 – Half Breed – A80 – Rat. The GT5SR Super Rat is a breed all it’s own in many respects and may be covered elsewhere for documentation and research elsewhere on this site. This site is under construction and is very new. Commonly these five styles of engines feature either a 38mm, 39mm, 39.5 or a 40mm stroke. Each has it’s advantages and all can be tooled and maintained to the point of having a very good and reliable engine. PK80: A 40mm stroke engine – PK stands for Power King which is no longer in business. PK80, A type piston, 85mm rod, 40mm stroke. A80, B type piston, 89mm rod. Here is a way to measure and know if you have the 110mm or 115mm Con Ron length without taking the motor apart. Stick a caliper or screw driver along the side of the rod and measure. If you measure around 80mm then you have the 110mm Con Rod, if you measure around 85mm , then you have the 115mm con rod. Another way to tell: If you have a 40mm stroke, the piston will likely come to the top of the barrel on TDC (or close to), if you have a 38mm the piston is likely to sit a little low in the barrel at TDC. This is important to know since the top ends are designed around the con rod length. Be aware that there are several different case bottoms as well as upper cylinders. Matching the correct combination is important on a good quality built engine. Type A = 15/16″ Bottom of piston to center of connecting rod. Used on 40mm rods. Also on specialized ZAE 50 rods 38mm stroke – If you have this rod and crank, double check. Type B = 1 1/16″ Bottom of piston to center of connecting rod. Used on 38mm rods and 40mm rods for specialized setups. Numbers listed below are a great guide however, there are no consistences with some of these items and hands on judgments are always best. If it doesn’t look correct or has to be forced it is most likely wrong. Pistons must roll all the way through a rotation cycle and the piston deck height needs to be at the top of the cylinder. Port timing and other modifications can be done after picking the right cylinder to crank to piston. It is all part of the hobby, enjoy. SX-OP = 111.47 mm (Overall) ????? ZAE 80 = 38mm or 40mm / Type B Piston – GT5 Type * Skyhawk – Double check piston/stroke! ZAF 50, ZAF 60, and ZAF 80. The higher the number, the longer, and therefore heavier. 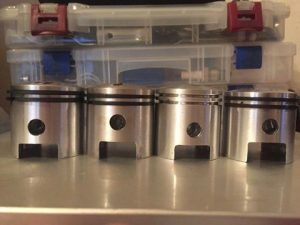 You can run a pk piston in a gt5 as long as the con rod has z-l on it or zaf 50 not the zaf 60 though and yes the jugs are different the biggest visual difference is the gt5 usually has a tapered transfer port window. GT5A and Super Rat 66cc use the same piston. #2 Be aware that there are 2 different #2 pistons on the market. 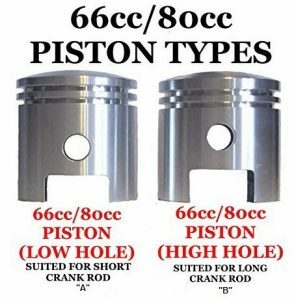 This piston fits most 66/80cc Flying Horse, Mega Motors, and RAW* engine kits. Thank you for visiting the website. We are still under construction but will be finished soon. We invite you to bookmark this site and share it with others. Dedicated to the performance, modification and maintenance of the PK 80 style two stroke engine and it's variants.